I have just been witness to sublime violence. Immanuel Kant, in “Analytic of the Sublime” from The Critique of Judgment (1790), relays: “The sublime . . . is to be found in [the] formless . . . for this directly brings with it a feeling of the furtherance of life, and thus is compatible with charms and with the play of the imagination” (83). He continues by suggesting that the imagination is at once being enticed by this play and “repelled” by it, which may lead the experience of “violence to the imagination” that is paradoxically “judged to be only the more sublime” (83). What does that have to do with Andrei Tarkovsky’s 1972 film Solaris? In brief, the film follows Russian psychologist Kris Kelvin on his futuristic journey to outer space to study the strange effects that the oceanic planet Solaris has been having on scientists stationed nearby. Solaris is sentient, and its waters prey on the human mind: its dreams, conscience, memories, and--especially--its wounds. Through these memories, projections of flesh and blood from individuals' pasts are conjured, notably Kelvin's ex-wife Hari who, we learn, committed suicide years prior. Strikingly, she becomes aware that she is not in fact his wife, but her own autonomous person. She slowly grows into a unique identity, apart from Kelvin’s memory, but ultimately decides to “annihilate" herself (there is a machine for exactly this purpose) in order to free Kelvin from the shattering disruptions of the “illusion.” Additionally, she rebels against being manifested in the image of another woman, fated to always return to him—even through death. However, at the end of the film, though we are made to believe that Kelvin has been saved from apparitions, we are also forced to wonder whether or not the last scene, if not the entire movie, has perhaps been only a figment of Kelvin’s imagination. We are left with Kelvin's unsettling transformation as a result of his interactions with multiple figurations of Hari. As she came to know her herself apart from his vision and idealization of Woman, she and Kelvin were able to form a mutual and raw connection. The more time spent with Kelvin, the more human she became. The more human, the more authentic their relationship. It seems that for a moment, when they both were able to recognize each other as two distinct Selves, without expectations or projections, there was love between lovers for the first time. Near the end of the film, Kelvin proposes that the exceptional power of being alive is in fact through our connections to one another. I recall Martin Buber’s I and Thou (1923), in which every connection to an-other becomes a moment of an I meeting a Thou, or a Me meeting the vibrant spark of a You; but You is too profane a word for the wonder that You are, so I will say Thou: “The primary word I-Thou can only be spoken with the whole being . . . I become through my relation to the Thou; as I become I, I say Thou. All real living is meeting” (11). Thou is what transforms us by a meeting of minds and hearts. So, why does this incite sublime violence in the psyche? Another scientist's words in the film (Dr. Snaut) reverberate deeply: “And you? Who the hell are you?” This film causes a confrontation with one's own inner desires and regrets. As viewers, we are left counting our own conjurings—memories that return over and over again, uninvited (or invited). In short, we are left questioning the line between Reality and Illusion. I am reminded here of August Strindberg's A Dream Play (1901), notable not only for influencing filmmaker Ingmar Bergman, but for its seamless blending of dream and reality. The dreamer, embodied in the character of Agnes, daughter of the Vedic thunderstorm God Indra, decides to visit earth to investigate human suffering. Ultimately, after finding humans pitiful and tormented creatures, she returns to the realm of the gods, preferring its peace and calm to the world of “Real.” Actually, her descent is at the end treated as a Dream, and her return to the dream world hailed as Reality. Incidentally, this brings us to the idea of the Vedic Maya, meaning “Illusion” in Sanskrit, and its relation to Vishnu, or the Supreme God. He is seated on Maya’s waters of Imagination and from his bellybutton births a lotus flower, and from this flower, in a dream-state, so-called “Reality” manifests. We are the Dream of God. At the same time, we are also the Dreamers of Maya. This begs the question: Are we figures in our own dreams? In an-other’s? In a lover’s? To dive into water in mythology is to quest for and to confront the mysteries of life’s secrets: Dread, Love, Temptation, Loss, Joy. Maya is at once the illusion of the Gods as well as the creation of all Existence. According to Heinrich Zimmer and Joseph Campbell in Myths and Symbols of Indian Art and Civilization: “Maya [is] the spontaneous self-transformation of an originally undifferentiated, all-generated divine Substance. And this greater maya produces, not the gods alone, but the universe in which they operate” (25). Further: “The maya of the gods is their power to assume diverse shapes by displaying at will various aspects of their subtle essence” (24-5). Are these the awe-inspiring and terrifying gods that take literary and visual shape to confront us with our own depths--no matter how dark, no matter how buried? 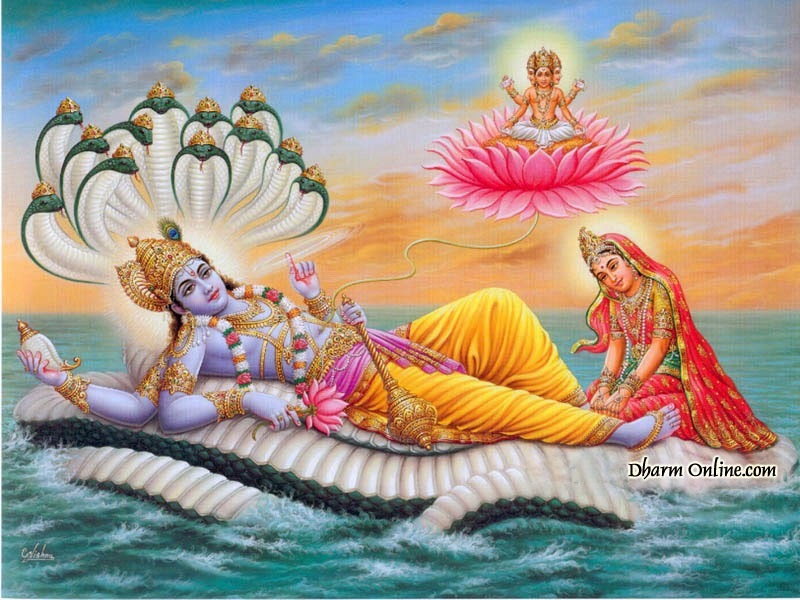 Moreover, Vishnu is teacher to Indra, who is father to Agnes, the embodiment of the dream world who walks into waking life. And here we have circled back to Solaris, in Hari, our own female manifestation of Illusion. She is, of course, at once being dreamed by Kelvin and creating the dream through the waters of Solaris. —Kahlil Gibran, Sand and Foam (23). I can also now officially vouch for Lem Stanislaw’s Solaris (translated by Bill Johnston in the first Polish-English version) as perhaps the most important work of fiction ever written.